These chicken fajitas use Old El Paso’s roasted tomato and pepper dinner kit to give the fajita an authentic Mexican flavour. 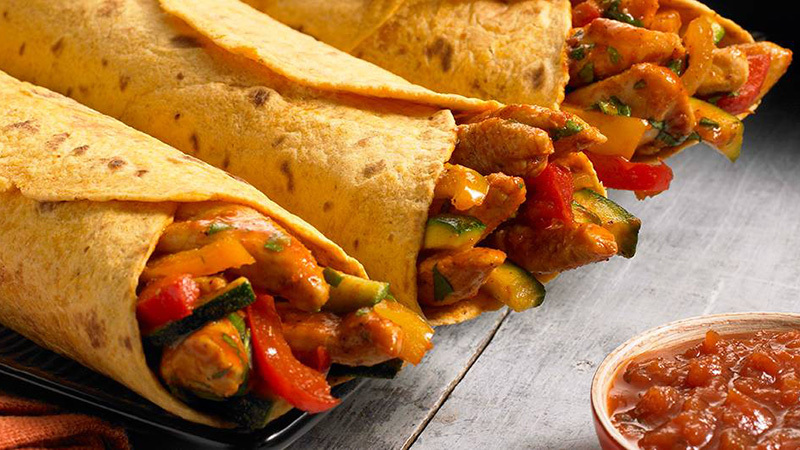 It combines courgettes peppers and onion, wrapped in a beautifully soft and fluffy tortilla wrap. It is a perfect treat for lunch or dinner and is best enjoyed with family and close friends. Heat the oil in a frying pan and cook the meaty chicken strips over a medium heat for 3-4 minutes until deliciously browned. Toss in the onion with the juicy peppers and fresh Mexican courgette and cook for 2-3 minutes, then sprinkle the Roasted Tomato & Pepper Fajita Spice Mix and the honey. Stir-fry until everything is coated in the sweet and spicy mixture and the chicken is golden brown and thoroughly cooked. Warm the Soft Salsa Tortillas, following the instructions on the pack. Slap it all on the table so everyone can make their own. Grab a couple of warm tortillas, spoon on some sweet, spiced chicken and sprinkle with coriander. Splash on the Roasted Tomato & Pepper Salsa and add some cooling sour cream. Roll it up and get stuck in!